On a dull, cloudy, still afternoon, ‘Ensians welcomed Aireborough, who had beaten them twice in the League last season. The visitors brought a big set of forwards and in the early stages it looked very much as though Old Ots would struggle to compete up front. Play was scrappy, passing loose and a penalty conceded by the home side in front of the posts saw the scoreboard move within the first minute. ‘Ensian full back Murphy ran the ball at Aireborough after a kick but a knock -on handed the initiative back. A penalty against the home side on their 10 metre line was struck beautifully and after only 5 minutes they were trailing by 6 points. Gradually, ‘Ensians began to get into the game and into opposition territory and Aireborough suffered three injuries, which disrupted their momentum. Mistakes and penalties were frequent and the home side did not help themselves by failing three times to find the touchline from the latter. The ball was therefore run back at them and playing in the right areas was proving difficult. Defence was good on both sides and eventually ‘Ensians had a difficult penalty chance to reduce the deficit, which they did thanks to a very good strike by Paterson. Mistakes were plentiful, but after a line-out steal, some tidy handling, then a kick through, Bateman outpaced the defence to score under the posts. Paterson’s conversion gave a lead of 10-6 to the home side on the half hour mark. A good kick-chase by Murphy, another clean lineout and Bateman put his head back to beat several defenders and score a classic winger’s try far out. The difficult conversion failed and half-time came with ‘Ensians in the lead at 15 points to 6. Territory belonged to the visitors, but the home side took points when they did manage to invade Aireborough’s half of the field. A sparse crowd of even numbers from home and away supporters urged their teams on, but the visitors were clearly in some disarray from their injuries and it was up to ‘Ensians to take full advantage. Their half-time substitutions were calculated and productive; Paterson at fly half had put in a good kicking shift, but Eaves moving to no. 10 changed the shape and with Luke Cowdell making immediate impact in the centre, the home threes began to look like a unit. Bateman took over the placekicking duties and an early 2nd half penalty took the score to 18-6, encouraging and discouraging in equal proportion. A lovely clean outside break by Cowdell brought a two-on-one and perfect timing put Eaves over, for Bateman to convert and increase the difference between the two sides. 25-6. 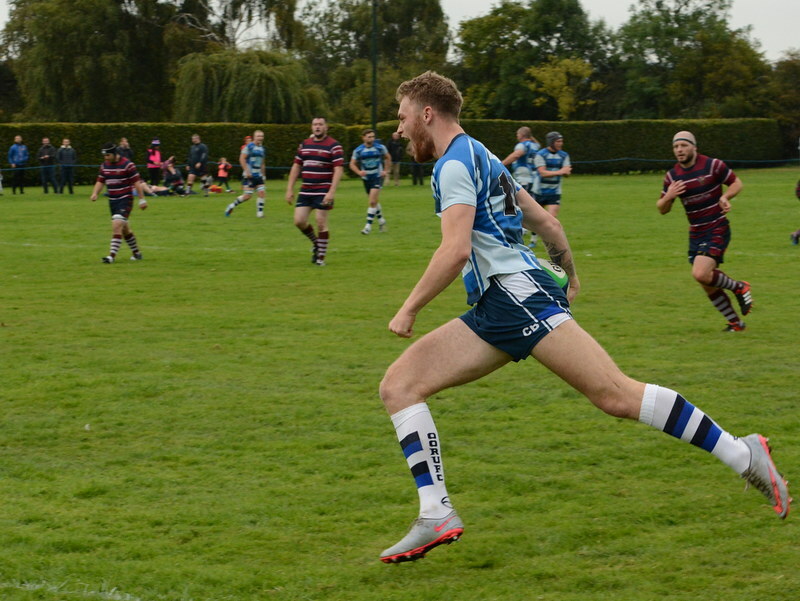 With ‘Ensians definitely on top now, confidence grew and things were going right, with accurate handling and Sam Featherstone prominent with clean “off the top” lineout ball. Aireborough fluffed a throw-in, ‘Ensians won the ball and Eaves put Murphy into a gap and under the posts. The 7 pointer made the end score 32-6. The final passages of play saw Cowdell kicking well out of hand and ‘Ensians generally in full control. You cannot argue with this, the fourth win out of four in the new campaign, but there is some tidying up to do in ball-management/execution of basics. A bit harsh, but the potential is clearly there.